The Language lab, which is designed by CACM (Centre for Advanced Communication), the brainchild of Mr. Sandip Pal, an IITian was set up at Narula Institute of Technology in the year 2002. The specialized Software ISILS (Interactive, Software Integrated Learning System) is central to CACM's learning laboratories. The focus of ISILS is on a conducive and congenial environment which would act as an impetus to bring out the best in an individual/group of individuals with regard to high interaction and involved participation. The accessories of lab are carefully selected with focus on utilitarian value. The language lab focuses on the enhancement of Communication skills, not just language but keeping in mind the PACK factor, which is Personality, attitude, Communication Skills & Knowledge development. The lab also facilitates to give an edge required for a student to make an impression in the corporate world. 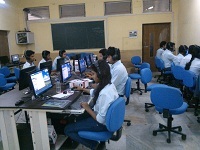 NIT boasts of a digital language & communication skills laboratory. It offers a super –efficient double-edged solution for both the tutor and the students. The trainers are provided with an opportunity, not only to teach efficiently but also to monitor the progress of each student individually-regardless the size of the students. For the learners, it provides an interactive learning experience as well as the opportunity to self –evaluate his/her progress. Our lab has a versatile and comprehensive 24-module campus resource planning software which helps the would-be engineers to become equipped for their professional life. Forty students can attend the course at a time.